Zaragoza, also known as Saragossa, is the fifth largest city in Spain with metropolitan population of roughly eight hundred thousand people. 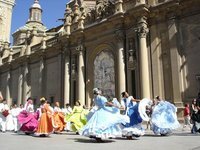 It is also the capital city of the Autonomous Community and former Kingdom of Aragon. The city lies along the Ebro River and its main tributaries. The city and region have had an extremely long history starting as a Carthaginian military post, which was conquered by Caesar Augustus. The Moors took over the city in 714 and held it until 1118. During that time it went on the control of many different Muslim Sultans. The Aragonese took control of the city and setup there own little kingdom. Although by 1137 they were pretty much under Castilian control. Zaragoza was a hot bed of activity during the inquisition, mainly because of a few local Priests that really took it on themselves to spread the message. The city suffered heavily during the Spanish Civil War with 500,000 to 1,000,000 people dying in the region. This is because the area was the centre for Republican Loyalist activity making Franco focus more on attacking it. Today Zaragoza is a growing into a major economic center. There are also many wonderful sights to see in the city and amazing hiking in the surrounding region. This city is a wonderful place to spend a few days. La Seo Cathedral is one of the main cathedrals in Zaragoza and is located on top of the old Roman Forum in the city center. A mosque was constructed on the site during the Moorish occupation but when the Christians reclaimed the city they built a Romanesque Cathedral on its spot, although the minaret from the mosque is still part of the current tower. From 1204 to the 15th century all the local kings were crowned in this church. The church has had its designed changed several times over the centuries. Today the church is a mixture of Romanesque, Baroque, Neo-Classical, Mudejar and Gothic styles. La Seo Cathedral and the Basilica of Our Lady of the Pillar share co-cathedral status in the city. The Museum of the Forum is a good museum located below the Plaza Del Pilar. Museum of Trapestries is a great museum dedicated to the woven arts. Museum of Fine Arts has many paintings from early Aargonese artists. Camon Aznar Museum has many paintings ranging from Rubes to Van Dyck. Lonja is the old currency exchange. Carmen Gate is the old city gate. Palaces - There are several 16th century palaces scatered around the city that are worth visiting. Aljafería is a large Moorish castle located outside the old town. Currently the castle is the seat for the regional parliament. Built in the 10th century this castle is very impressive with amazing towers and stone work along its walls. One of the main features is the Troubadour Tower, which was built in the 9th century. The tower was the setting for Giuseppe Verdi's opera The Troubadour. Zaragoza is mainly a mediterranean continental desert climate, this is because the city is walled in on all sides by mountains. The average rainfall is only 310 mm, which makes for many sunny days. Most of the rain occurs in the spring. The summer is extremely dry with temperatures reaching up to 40 °C. The winters tend to be foggy with temperatures between 0 °C and 10 °C. Zaragoza Airport (ZAZ) is a medium sized airport outside of the city. It is also a Spanish Airforce Base and an emergency landing strip for the NASA Space Shuttle. There is a bus service that connects the airport to the city every half hour.Currently, Air Europa flies to Lanzarote, Palma de Mallorca and Tenerife-South, Air Nostrum to A Coruña, Frankfurt, Madrid and Paris-Orly, and Ryanair to Alicante, Brussels-South Charleroi, London-Stansted, Milan-Orio al Serio and Rome-Ciampino. Intermodal Zaragoza Delicias Station is the main train station downtown. The city is on the Madrid to Barcelona Spanish High Speed railway line. Madrid is only 1 hour and 15 minutes by train and Barcelona is only 1 hour and 30 minutes. There are also long distance railway lines and local Cercanías lines, which are slower. A cheaper way to get to Zaragoza from Barcelona is using the "Regional Express" - a slow train going on an ancient track, stopping at every small village and some those post-industrial ghost towns, and really astonishing landscapes. The ride takes 5 hours, costs €22. Other neighbouring cities like Huesca, Teruel, Pamplona, Logroño, Bilbao or Valencia are connected by a few daily conventional trains. All trains and buses arrive to Delicias station. The city centre is some 2 km away from, and can be reached using urban buses 34 and 51 or by taxi (10 minutes, around €10). Zaragoza is very well connected by free speedways with Huesca (1 hour), Teruel (2 hours), Madrid (3 hours), and by toll highways with Barcelona (3 hours, €30), Pamplona and Bilbao. Traffic around the city is relatively light except on some weekends and holidays. You can reach Zaragoza either from Madrid or Barcelona in 3:45 hours. The coach company is ALSA and the single/return ticket costs around €15/€26. Zaragoza is also well communicated with other main capital cities, such as Valencia and Bilbao. There is possibility of getting to Zaragoza from France by bus. The main lines travel from Lourdes, Tarbes, Pau and Oloron. The taxi drivers are plentiful and mostly honest. If you plan on busing around, a card costs €7 at any tobacco kiosk (initial card fee of €2, so when charging it next time will just cost €5). With the card you can change lines within an hour without being charged again. Single tickets are €1.35. If you stay in or near the old town, most is walkable. There is a shared bicycle system called Bizi. It has a fairly good website in English which allows you to get a temporary subscription online beforehand. This subscription is valid of three days and costs €5.28. As with most shared bicycle system, the first 30 minutes are free after which you'll pay €0.52 per additional 30 minutes. This is up until 2 hours, after which you'll have to pay a penalty of €3.16 per hour. The deposit is €200. After getting a temporary subscription online, you receive a subscription number which, together with your pin code of choice, enables you to take a bike immediately upon arrival in Zaragoza. Bike availability is usually good, and there are plenty of stations in the city centre, as well as near the Delicias train station and the expo area. Zaragoza is well known because of its many tapas bars. A "Tabla" is a wooden plate in which different tapas like cheese and sausages are served, often with a bottle of wine in the price. The best place to get tapas is the old tapas, commonly called Casco viejo with is a bunch of small streets overflowing with restaurants. There is a number of good wines produced in Aragon. Tareas of Calle de Espoz y Mina and Calle Mayor, which are a stone's throw from Plaza del Pilar, have plenty of varied bars from which to choose. The main night club districts are El Tubo, El Casco Viejo, La Zona, El Rollo and El Ambiente. El Ambiente is the gay friendly scene. 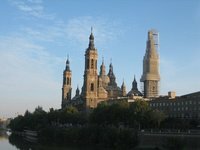 Accommodation is a reason to visit Zaragoza in itself - if you plan to visit both Madrid and Barcelona taking advantage of the fast train connection, you can choose to stay here, halfway between them. Not only will you pay less for the combined train tickets to Zaragoza from either city than from the entire Madrid-Barcelona AVE ride, but you will also benefit from the much lower rates hotels charge in Zaragoza. And all the attractions of Zaragoza are an added bonus on top of it! 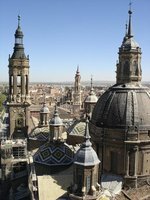 We have a comprehensive list of accommodation in Zaragoza searchable right here on Travellerspoint. You can use our map to quickly compare budget, mid-range or top of the range accommodation in Zaragoza and areas nearby. This is version 20. Last edited at 14:54 on Oct 11, 17 by Utrecht. 19 articles link to this page.